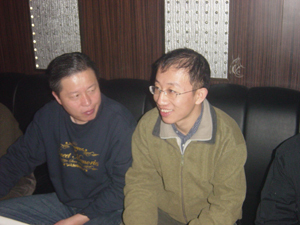 After Beijing human rights advocate Hu Jia exposed his phone conversation with attorney Gao Zhisheng to the world on April 6, Hu then began to fight for Gao and his family's freedom. Four days later Hu was again put under house arrest and his phone line was cut off. Hu believes the house arrest this time is to stop him from taking any further actions to help Gao Zhisheng. According to Hu, Zeng has had intense verbal confrontations with the police twice. On April 12, Hu and his wife went downstairs for a walk, but they were stopped by the police. In order to protect his wife, Hu ended up having a physical altercation with the police. Gao's recent letter has now been made public and has attracted international exposure. Hu believes Gao had no choice but to do this. Hu believes that there are two possible outcomes: one is Gao will go to prison again and his wife and children will continue to be humiliated and treated with brutal force, and two is Gao's circumstances will be much improved. The communist regime are unable to tolerate any international pressure especially in the lead up to the 2008 Olympics, so it may compromise by removing the surveillance and tracking of Gao for now. Hu emphasized that, once he regains his freedom, the first thing that he will do is visit Gao and continue to reveal Gao's persecution and his current status to the outside world.